For the holidays, our only wish is for you to help us save more lives and to continue to rescue responsibly. Our goal is to raise $7,500 to grant the wish of homeless dogs in shelters that need medical care, a warm, soft place to sleep and a family who will love and care for them. Please help us continue to rescue responsibly by donating today. Join our Inner Circle Membership Program starting at $10 a month. Simply click on “monthly” on the donation form below to join. With reliable income from monthly gifts, you will help us continue our mission of rescuing responsibly. Is one-time giving more your speed? Give a one-time gift. Give a tax-deductible one-time donation to celebrate our birthday! Your generous gift will help us save homeless dogs and puppies and help them find their permanent, loving homes. Every gift makes a huge impact. 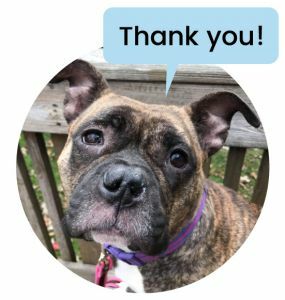 Thank you for helping us save homeless dogs and puppies!